OutBack’s pre-assembled and pre-wired FLEXpower systems are now equipped with the updatedFXR Series Grid/Hybrid inverter/chargers. This means that the most advanced Grid/Hybrid inverter features are now available on the industry’s most trusted and proven systems platform, for unmatched flexibility and value. 6 models available for 120VAC or 230VAC applications, ranging from 2500W to 3600W. 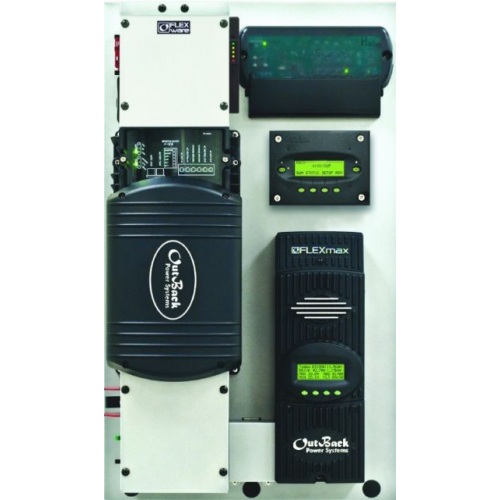 The FLEXpower ONE FX-R Series is ideal for residential and commercial applications including cabins, vacation homes, farm buildings, remote communications sites and back-up power systems, with all necessary components integrated into a compact hang-on-the-wall system with a minimal footprint.